In days like these, dominated by dark clouds of marginalisation and isolationism, an artist like Christian Kjellvander is absolutely critical to our spiritual salvation. The Swedish singer-songwriter embraces the foreign, the unknown and seeks out the most profound sense of humanity. Take the title of his ninth album “WILD HXMANS”: something is different, disconcertingly so. 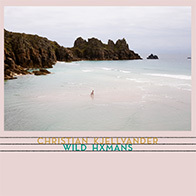 Christian Kjellvander slips us an X for a U. He forces us to think, sets our senses on edge. We cast our vote with an X, but we also use it to blot out a mistake. “Cross it out and forget about it – if this is how people treat each other, then we have a problem”, Christian Kjellvander suggests.